Crocodilians possess several unique skin glands that have been shown to produce unusual compounds. the paracloacal glands are a set of glands located on either side of the cloaca of all crocodilians. Although their function has been difficult to clarify, Dr. Paul Weldon had been working to better understand the makeup and purpose of the chemical secretions porduced by these glands. Through his work, several compounds have been discovered that are found in no other vertebrates. Some of these compounds are even species specific. They are believed to function in part as pheromones and possible species recognition. 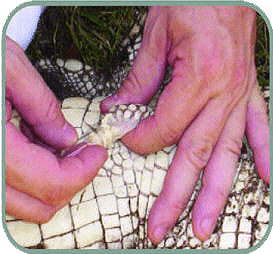 Whatever the function, their existence denotes novel biosynthetic capabilities possibly unique to the Crocodylia.